WASHINGTON (Reuters) - Federal Reserve Chair Janet Yellen said U.S. labor markets are far from healthy and signaled the Fed will keep monetary policy loose until hiring and wage data show the effects of the financial crisis are "completely gone." Despite strong recent jobs reports and other signs of continuing recovery, Yellen emphasized in testimony to the Senate Banking Committee that she won't conclude the economy has recovered until wages start rising and discouraged workers return to the labor force. In its latest semiannual report to Congress, the Fed did cite unease about some aspects of U.S. securities markets, taking the unusual step of singling out biotechnology and social media stocks for their "stretched" valuations. The observation hit biotech stocks with some of their biggest losses in months, while social media companies like Yelp slid as much as 4 percent. But Yellen's overall testimony and an accompanying written report to Congress said asset values were in line with "historic norms," and that the economy would continue to grow if supported by the Fed's current low interest rates. Yellen said the one thing that might prompt the central bank to raise rates earlier or faster is if hiring and wages take off in an unexpected way. So far, there is little evidence that is happening in a country with still high unemployment, and labor force participation at its lowest level in a quarter century. "While we are making progress in the labor market we have not achieved our goal," Yellen told the committee. "There have been substantial headwinds holding the recovery back ... Until they are completely gone it calls for an accommodative monetary policy." Wage increases "have been nonexistent," she said. "We have seen a steady shift of national income from labor to capital, and there is room for wage gains before we are worried" about inflation. U.S. stock markets dipped after the release of Yellen's testimony and the accompanying report, as investors assessed whether her comments about specific stock sectors were a warning shot akin to former Fed Chair Alan Greenspan's remarks about irrational exuberance or a footnote in an assessment that sees the U.S. economy generally making progress. Cornerstone Macro's Roberto Perli said it was significant that Yellen's testimony was not as pointed regarding stock values as the written Fed report. "I don't see Yellen or the Fed changing their mind anytime soon," about the path of interest rates, currently expected to be increased in the middle of next year, Perli said. He called the observation about stock values a "rhetorical side note." 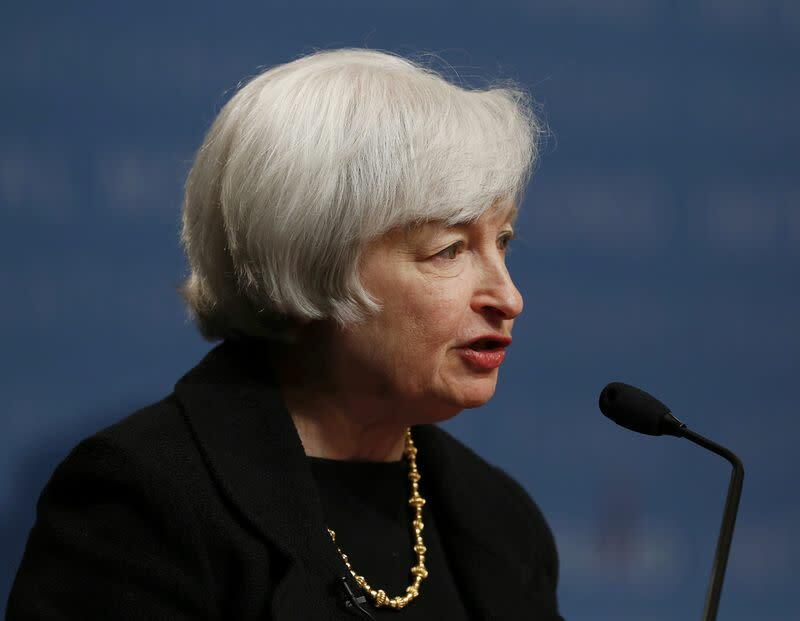 Yellen described an economy that continues to generate jobs and relatively steady growth. Yet Fed policymakers currently expect their preferred measure of inflation to stand at between 1.5 percent and 1.75 percent for 2014, short of the central bank's 2 percent target. Fed chiefs report to Congress twice a year on monetary policy, and the hearing on Tuesday was Yellen's second such appearance. Her first turned into a marathon grilling. This one was shorter with few sharp exchanges. One exception: Senators who feel the Fed has not done enough to fix leftover issues from the financial crisis, such as how to handle banks considered too big to fail. Massachusetts Senator Elizabeth Warren, a Democrat, pressed Yellen on whether the Fed is doing enough to make banks like JP Morgan develop plans that would allow for an orderly bankruptcy without taxpayer support. Those resolution plans, Yellen said, number in the tens of thousands of pages and are "complex ... We need to give these firms feedback" to fine tune their plans.